Pirate station Radio Hauraki broadcast its first scheduled transmission from the vessel Tiri in the Colville Channel between Great Barrier Island and Coromandel Peninsula. 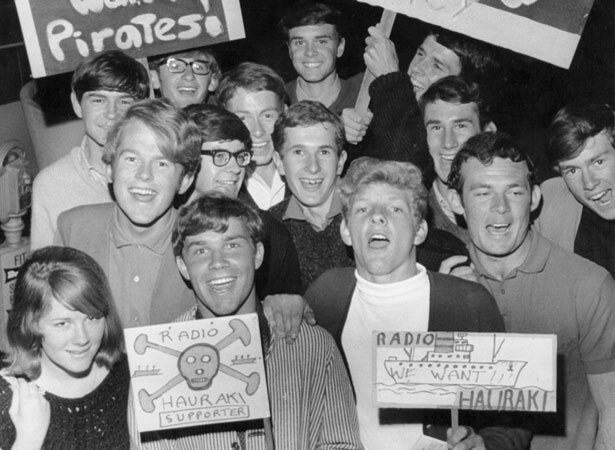 The brainchild of journalist David Gapes, Hauraki challenged the monopoly of the conservative New Zealand Broadcasting Corporation, which held little appeal to 1960s teenagers. When their attempts to secure a private broadcasting licence failed, Hauraki decided to broadcast offshore. Test transmissions from the Tiri began in earnest on 1 December. The first song played three days later – Matt Munro’s somewhat symbolic ‘Born Free’. Over the next 3½ years, legal challenges and incidents at sea tested the resolve of those involved. In January 1968 the Tiri hit rocks on Great Barrier Island. A replacement vessel, the Kapuni (dubbed Tiri II), also ran aground. In March 1970 the Broadcasting Authority awarded licences for the Auckland area to Radio Hauraki. Hauraki’s last pirate broadcast was made on 1 June 1970. ‘Born Free’ closed the transmission. Hauraki’s triumph was tinged with tragedy when announcer Rick Grant was lost overboard on the return voyage to Auckland that evening. We have 10 biographies, 5 articles, related to Radio Hauraki rules the waves.